YAOUNDE, Sep 26 2017 (IPS) - “For too long we have been afraid to speak out against injustices and all sorts of atrocities happening in Cameroon, thinking it [the silence] will protect us. If I were to repeat what I have done on Canal 2 English [television], I will do it again. I now stand ready for any eventuality,” says Cameroonian journalist Elie Smith. The outspoken journalist told IPS he was forced to resign from Cameroon’s leading private media house following intense pressure from government. The CEO of the station had suspended a talk show, Tough Talk, Smith co-hosted with Divine Ntaryike and Henry Kejang. He said Prime Minister Philemon Yang and Justice Minister Laurent Esso wanted him fired. Journalist Tim Finian Njua was brutally attacked and taken away by unknown men in Bamenda. He only realised they were security officers when he was brought to Yaounde. The trio were accused of being too critical of government, especially during reporting and analysis of an ongoing 11-month-long protest in English-speaking Cameroon. Protesters had adopted civil disobedience as their trump card, keeping schools and courts in the region closed since Nov. 21, 2016. Smith, who had refused to travel from the financial capital, the port city of Douala, to Yaounde, the country’s political capital, to apologise to the prime minister for being too critical of government, was later told to stick to a program called World Views and refrain from any discussion of domestic politics. “On Sep. 4 when schools were expected to resume in Cameroon, protests marred the resumption in English-speaking Cameroon. Yet, the CEO asked me to lie on air that resumption was effective in order to please government. I refused. That is when we both realised we can no longer work together,” he told IPS. Despite losing his job, Smith is among the few journalists who have avoided prison in a government clampdown on reporters since the crisis erupted in English-speaking Cameroon. Others have been jailed and tortured, while some are currently in exile. For the most part, security forces target English-speaking journalists whom government accuses of supporting or sympathising with “terrorists”. Cameroon was first colonised by the Germans in 1884. After the defeat of Germany in World War I, France and Britain shared the territory under a mandate from the League of Nations, with Britain keeping one-fifth of it. A federation of two states with equal status was declared in 1961, but was abolished in 1972 following a referendum – its conduct remains contested to this day. Citizens of the former trust territory of British Southern Cameroons who have over the years, complained of marginalisation and lack of control over their assets, rose up in October 2016 in two ranks- some demanding a return to federation while others demand total independence. Both camps however agree on the same complaints; insignificant placements of English-speaking Cameroonians in administration, and inequality which they say led to impoverishment of their region and its population and subjugation of their educational and cultural heritage. At least 13 people have been shot dead since the crisis erupted. A controversial law on the suppression of acts of terrorism in Cameroon enacted in December 2014 is being used to try citizens arrested in relation to the protests. Journalists arrested for reporting on the crisis are equally tried at the military tribunal under the same law which forbids public meetings, street protests or any action that the government deems to be disturbing the peace. Tim Finian Njua, one of eight journalists arrested in relation to the ongoing crisis, says he is finding it difficult readjusting after spending over six months in jail. The editor of Life Time newspaper, Njua was freed from the Kondengui Prison in Yaounde alongside Atia Tilarious and two other journalists, and close to 50 protesters, following a presidential clemency in August. Atia Tilarious, who had earlier been arrested and released for hosting a TV debate on the uprising, had gone to Kondengui after his first arrest, this time in the company of Amos Fofung, a reporter for The Guardian Post newspaper. 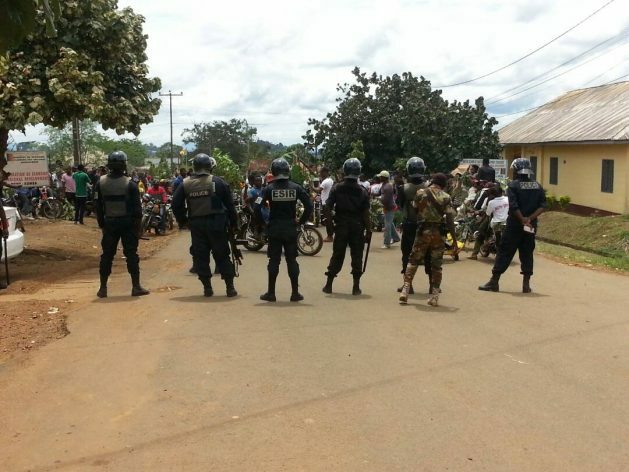 Meanwhile Fonjah Hanson Muki, proprietor of Cameroon Report, was arrested alongside five of his staff in the town of Bamenda, which is regarded as the epicentre of the uprising. They were accused by a military tribunal of propagatng false information. They were also accused of receiving money from secessionists abroad to push a separatist agenda through their reporting. The last of them, arrested on July 25, was released on Sept. 18. The media owner was ordered never to report on the ongoing crisis. Before the clampdown on journalists reporting the crisis, the national communication council had issued a warning to journalists in the country, tacitly outlawing all media debates on the return to federation. Though the council’s decision preceded a speech by President Paul Biya making the topic taboo, French-language media organs continued the debate, while English-language tabloids piped down. “You know we are not the same. There are things Le Messager or Le Jour can report and go free but The Guardian Post or The Sun will be sanctioned for doing same. The public does not understand, that is why you find citizens criticising us on social media, saying we are chicken-hearted,” a newspaper publisher who asked for anonymity told IPS. The council has been criticised for siding with state officials and influential citizens. It meted out sanctions on Sep. 22, suspending some 20 media organs, publishers and journalists for periods ranging from one to six months. Most of the decisions were verdicts on complaints filed by government officials like the Minister of Forestry and influential citizens like Cameroonian football star and billionaire, Samuel Eto’o Fils. Ahmed Aba, Cameroon correspondent for the Hausa service of the French international radio, RFI, is currently serving a ten-year jail term. He was found guilty of “laundering of proceeds of terrorism” and “non-denunciation of terrorism” by the military tribunal in Yaounde. The verdict, handed down this year after two years of pre-trial detention, was appealed by his lawyer, Clement Nakong. Aba told IPS at the prison yard in Yaounde that he is innocent and hopes to be set free after the appeal. He said he was accused of working for the Nigeria-based Boko Haram terror group. But the outcome of an appeal is uncertain as a government spokesman bluntly declared at a press conference that RFI supports terrorists. The appeal hearing was expected to begin among others in mid-August this year, but Aba’s name was taken off the list. International and local institutions and activists have been advocating for his release. He was recently named one of the winners of the 2017 International Press Freedom Award by the New York-based Committee to Protect Journalists (CPJ). Another journalist, Gubai Gatama, was placed under investigation and interrogated at the police headquarters for reporting on Boko Haram. On Sep. 20, CPJ issued a report, written by Quintal, warning that in addition to detaining journalists, authorities have banned news outlets deemed sympathetic to the Anglophone protesters, shut down internet in regions experiencing unrest, and prevented outside observers, including CPJ, from accessing the country by delaying the visa process.